Let see now. Roughly I am able to know how much my monthly money flow from this chart I just created. Yeah. I really have nothing to do now apart doing this sort of random stuff. As you can see from my current Income chart, most of my income came from my fixed income. My business sales and loan are my variable income. So for now I need to increase my business sales to about 5% to compensate with the stock purchases. I am still studying other aspect to increase my income from time to time. Other than that, I am having quite a stable income. 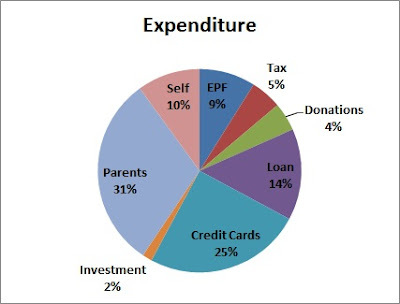 When it come to the Expenditure chart. There still few room for improvement. 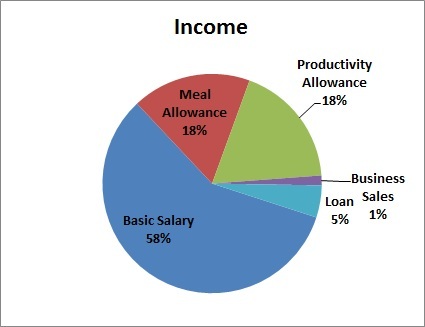 Since my parents will be receiving a 50% from my basic salary, the rate of ~31% will be a fixed expenditure. As for loan, this year there will not be any increment or reduction. The investment are fix at 2%. However, additional 99% increment of one time investment is being finalized by the end of this month. The credit card usage and payment are mainly due to backdated spending and progressively being cut down to as minimum as possible. I am expecting to reduce the credit card usage this year to 10% by the end of 2012. The donations will be increase to 7% proportionate with the reduction of credit card. Saving are included under self and will be maintain at 10% for this year. Apart from that, miscellaneous expenses will be recorded under self such as repairs, petrol, and personal expenses.